As they prepare to participate in society as critical, productive adults, adolescents are faced with the challenge of understanding, analyzing, and synthesizing a barrage of information. For 21st-century literacy, adolescents must be able to read and write in different modes and disciplines and to engage with a variety of print and digital materials, both effectively and responsibly. Libraries play a key role in helping adolescents navigate these dynamic challenges, and ALA is at the forefront of that work. The Hub: Your Connection to Teen Collections– Content on this blog is created by YALSA members and teens. The mission of The Hub is to provide timely information about emerging and new practices for evaluating, selecting, and curating materials; raise awareness about appropriate YALSA tools to facilitate innovation in teen collections; and provide resources for members and the library community to support their efforts to continuously improve their teen collection and content curation. Teen Read Week is a national adolescent literacy initiative created by YALSA. It began in 1998 and is held annually in October the week as Columbus Day. Its purpose is to encourage teens to be regular readers and library users. The division offers an Advocacy Toolkit that provides practical steps, strategies, and statements for advocating for library services for teens. In April 2016 YALSA published “Adopting a Summer Learning Approach for Increased Impact: a YALSA Position Paper.” This free resource provides a vision for summer learning programs in the 21st century and can be shared with library co-workers, supervisors, trustees, partners, funders and more. The paper also includes a list of recommended resources that libraries can consult for information and strategies for updating or enhancing their current summer programming. For additional summer learning resources, visit http://summerreading.ning.com/. YALSA maintains a comprehensive list of teen book lists and awards focusing on diverse titles. For more on adolescent literacy, see YALSA’s collection of downloadable resources and YALSA Academy’s videos. 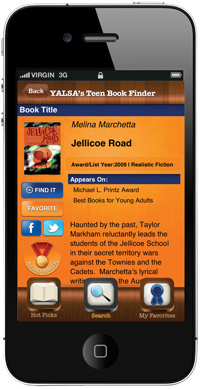 A free online database and app helps teens, parents, librarians and library staff, educators, and anyone who loves YA literature access nearly 4,000 titles recognized YALSA’s awards and lists on their smartphone. Created by YALSA, the Adolescent Literacy Wiki highlights principles for promoting literacy growth among adolescents, provides key statistics, and links to tools and resources for educators and funding sources. The Coretta Scott King Book Awards, part of ALA’s Ethnic and Multicultural Exchange Round Table (EMIERT), are given annually to outstanding African American authors and illustrators of books for children and young adults that demonstrate an appreciation of African American culture and universal human values. The Stonewall Book Award-Mike Morgan and Larry Romans Children’s and Young Adult Literature Award is given annually by ALA’s Gay, Lesbian, Bisexual, and Transgender Round Table (GLBTRT) to English-language children’s and young adult literature of exceptional merit relating to the gay, lesbian, bisexual, and transgender experience. The Amelia Bloomer List is a compilation from The Amelia Bloomer Project, a committee of the Feminist Task Force of the Social Responsibilities Round Table. The list is an annual annotated book list (or bibliography) of well-written and well-illustrated books with significant feminist content, intended for young readers (ages birth through 18). Read it Forward, an initiative of Penguin Random House, curates a list of Young Adult Books You Need to Read.